The Jacksonville Jaguars are down to their fourth left tackle, starting a player they signed off the streets against Pittsburgh on Sunday. JACKSONVILLE, Fla. (AP) — The Jacksonville Jaguars are down to their fourth left tackle, starting a player they signed off the streets against Pittsburgh on Sunday. 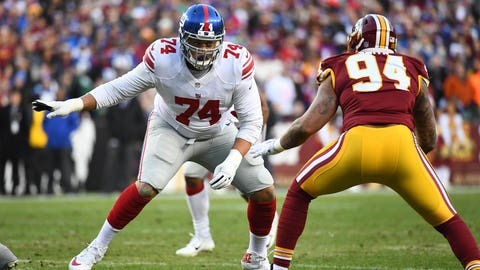 Coach Doug Marrone says former New York Giants first-round draft pick Ereck Flowers will start in place of Josh Walker, who missed practice all week because of a foot/ankle injury. Walker was listed as doubtful on the injury report Friday. Flowers and Walker alternated series last week at Indianapolis. Walker was filling in for Josh Wells, who started four games after Cam Robinson tore a knee ligament in Week 2. The Jaguars (3-6) also could be without another starting offensive lineman. Right guard A.J. Cann (hamstring) is listed as questionable. Nose tackle Marcell Dareus (triceps) also is questionable. Dareus has started all nine games.